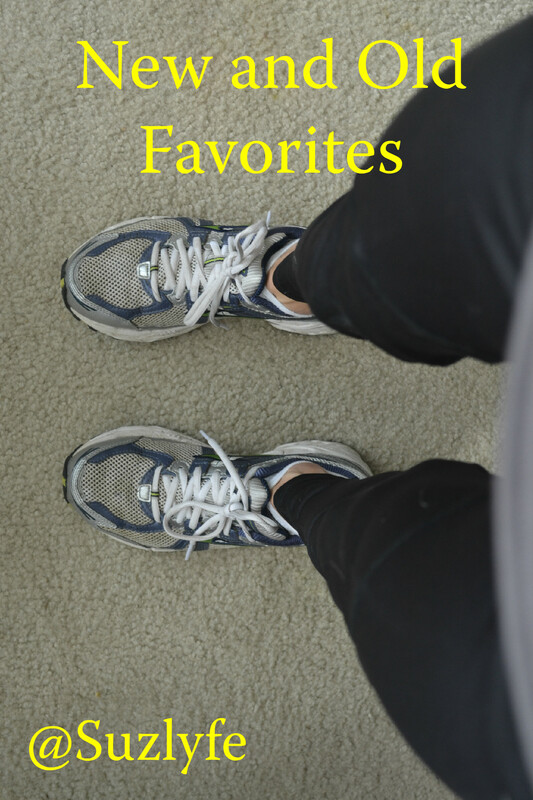 So, I would imagine that the majority of my 5 readers are runners and that all of you have an interest in food (actually, I know this to be true). Thus, I know with absolute certainty that this post will capture your interest. This year for Christmas, I got some really awesome gifts, some expected and some not. But I’m not going to talk about those. Instead, let’s. talk. running. gifts. Noms. And yes, I do mean noms. Lori even sent me a Crazy Ties to “apologize”! Don’t mind if I accept her (unnecessary) apology…. So what did I procure (largely for myself, but I waited until Xmas to open and did so with Alex’s blessing)? First off, this is indeed a change for me. Not with regards to brand (I am loyal to Brooks until I am informed otherwise), but with regards to the shoe. I used to be a Nike girl, and I wore them (and designed custom ones online) until the summer I met Alex, actually. And though my Brooks never put a ring on it, I have gotten some nice jewelry with them. Namely, the Defyance 5s. Confession. I have a hoarding issue with my Defyances. I have owned 5-6 pairs of them, and when they started to introduce the new version, I bought 3 pairs (lol) on sale. 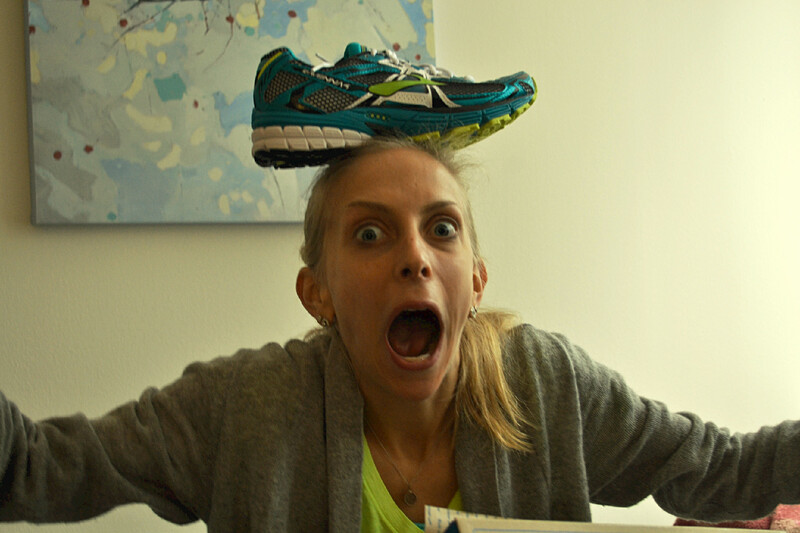 I moved to the Defyances, which are a neutral trainer with the feeling of the Adrenalines (a more supportive shoe), in spring of 2012 as I trained for my first half marathon. Prior to that (ie, 2007-2010), I went through 3 or 4 pairs of the Switch, with a brief foray into the Adrenaline 11s. The Switchs intro’d me to Brooks, and I haven’t looked back. Too hard. So why the changes? First things first, I have very pronated ankles. If I can convince Alex to take a pic for me, I will. I get it from my dad, and my brother’s ankle bones nearly touch the floor. No joke. I have been in custom orthotics since 9th grade (when I started working out seriously), and I got a new pair of orthotics and moved to the Switch in 2008 (yeah, l.o.n.g. overdue). I got put in the Switch at Ragged Mountain Running Shop in Charlottesville, VA, and I do believe that they were the right shoes for me at the time. I hadn’t started to correct my stride, and I was starting to have some knee issues. Solved. I tried out the Adrenalines because I had heard so many good things about them, but I got hurt in them pretty quickly (through no fault of theirs). Back to the Switch for a bit, and then I got fitted again at Super Runners in NYC. They put me in the Defyance (while I was their, I tried out the Wave Riders and Ghosts but didn’t like either of them) due to the fact that I wore orthotics. The Defyances gave me the mental security of greater support through the arch, but were more neutral. So why am I going to the Ravennas? I had some pretty significant ITB issues this past marathon cycle, and I have been dealing with stride inconsistencies for a while now. I obviously wasn’t going to change a month out (even though I seriously contemplated it), and I couldn’t afford it or new orthotics, either. This off season presents the perfect opportunity to get back in a more supportive shoe whilst I log base miles and also work on my stride. I am planning on getting professionally fitted again in the spring before the Atlanta Half and the prep for fall marathon training. I needed something to get me there. And, to be perfectly honest, after years of running in the rather mundane Defyances, when I saw the teal version of the Ravennas at the Chicago half, I literally had an immediate visceral reaction. Now that they are about to move to the next version, mine are on sale, and so DONE. 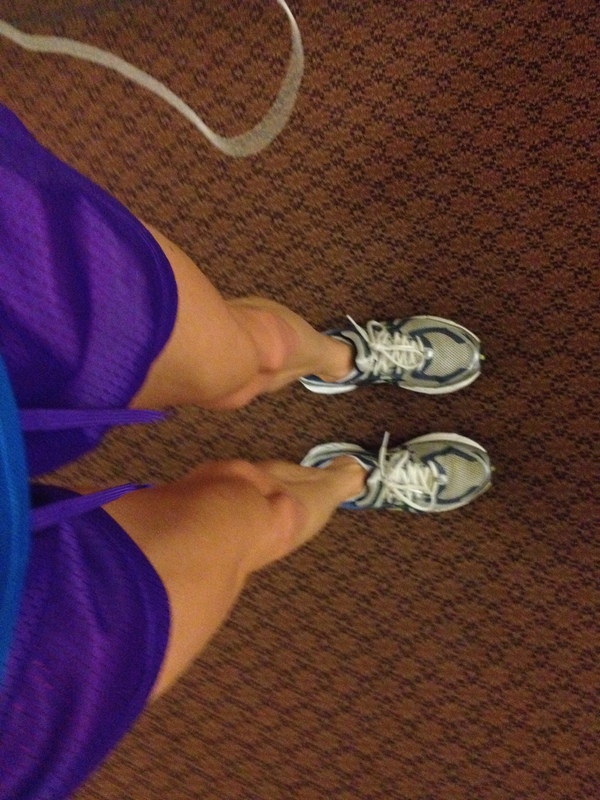 I planned on running on them on Thursday, but icky outside conditions and my disinterest in ruining my new babies meant that I put off running in them but instead tried out some of my other new things!!! Let me be straight up. These tights are amazing. 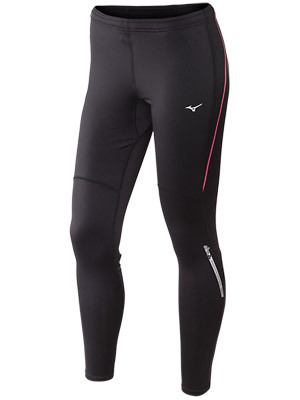 (AND STILL ON SALE) So comfortable, felt seamless to my skin, and not pulling/pressing/riding up at all. There is a zip pocket on the booty, and the calves also have zips. 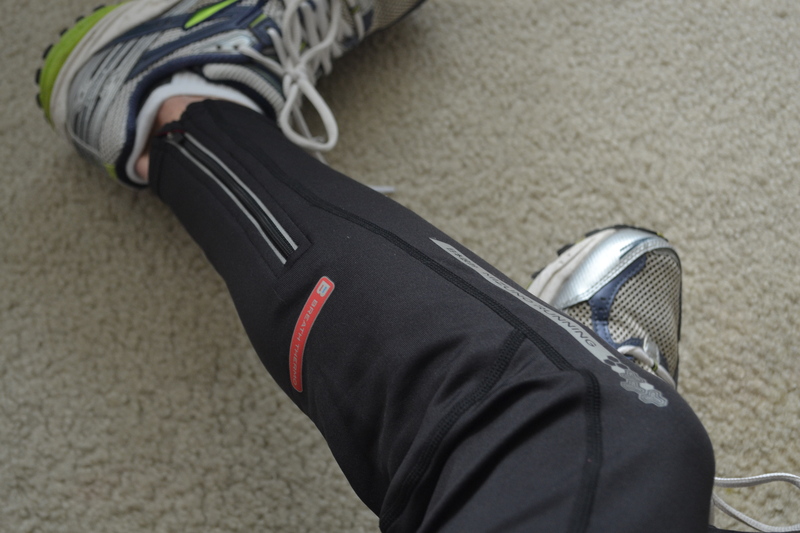 I totally forgot about the breathy panels until literally just now, but I remember multiple times during my run being so impressed with how perfectly climate-controlled my legs were. There never got cold, or felt wind-chilly, or over heated–when I was running today, it was in the high teens with wind chills of about 10, and it started flurrying while I was out. I wore short socks while running for extra climate control, but I can easily say that these will be a go-to. The other new purchase that I tried out today? My new C9 knit hat. 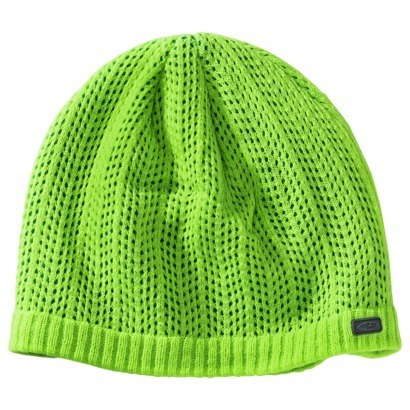 In Lime Green, of course. Loved this too. Function, just warm enough, and long enough to actually cover your earlobes. There is a lining on the interior that keeps you from getting all staticky, but I will say that if it is exposed to cold air prior to your head, the lining does get chilly (I remember this from the store). But a great price, great color, and so far, I love! That last piece of clothing that you see there? The Pearl Izumi Infinity Shrug. Now this I am really pumped about. I always have a great deal of difficulty with cooler temps. I get very cold very easily when my shoulders are exposed, but sometimes you don’t want a full jacket (I have often rolled up my outer shirt while running). I purchased a pair of Brooks arm warmers about a year ago, but I have yet to use them because I always feel like I would want something over my shoulders. BOOM. Roasted. 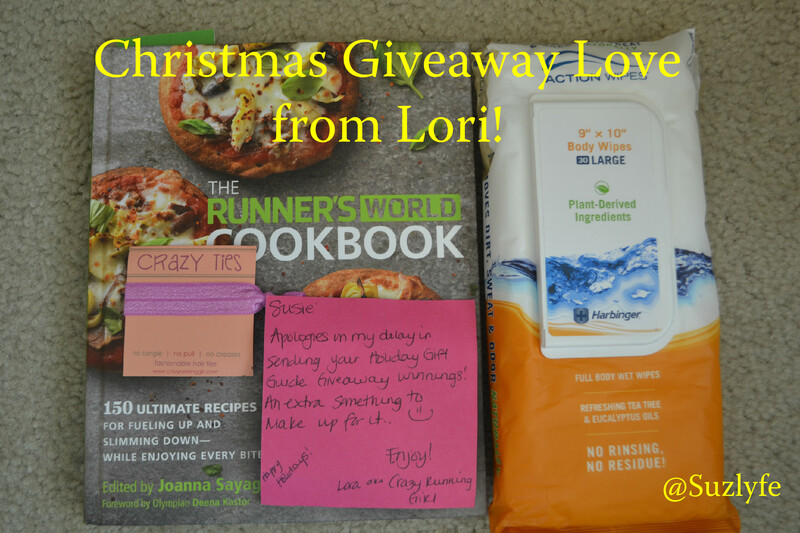 My lovely gifts from Lori of Crazy Running Girl. I won this from Lori over at Crazy Running Girl in HER favorite things giveaway, and even though I received it later that week, I dutifully left it in the packaging because otherwise I wouldn’t have been able to keep my hands off. I am just cracking it open, but I can tell this will become one of my favorite books. It is beautiful organized, labeled, and structured for runners, foodies, and people who love to cook, or just want something on the fly. Even though I don’t like to follow recipes per se, I would say that this will become a go-to because these people think like I do. I have been wanting to try these since I first heard about them (probably from a Ragnar Relay recap?). I used to love the little individually wrapped cleansing towelettes from Whole Foods (the ones that come in lemon, lavender, orange, eucalyptus, and mint), but those can get expensive pretty quickly. These are more substantial and will be able to stand up to more…impressive jobs that involve vastly larger amounts of dirt, sweat, salt, sand, and odor (I smell???). Plus, sometimes you just don’t want to shower. And Alex realllllly hates that. But sometimes, I gotta cheat. Can’t wait to try these out! My last and unexpected gift is my new shiny Crazy Ties. So much better looking that my usual ponytailer, and I’ve heard such great things about them. Maybe I’ll even do a giveaway with her and them in the future! THANK YOU SO MUCH LORI. No kidding, each of these gifts were already on my list, and the fact that I won them from a favorite blog makes the getting that much sweeter. You should all be planning on finishing my post, leaving a comment, and then going over to visit her! She has been running plans on the horizon, and she would love some advice from any local Texans! 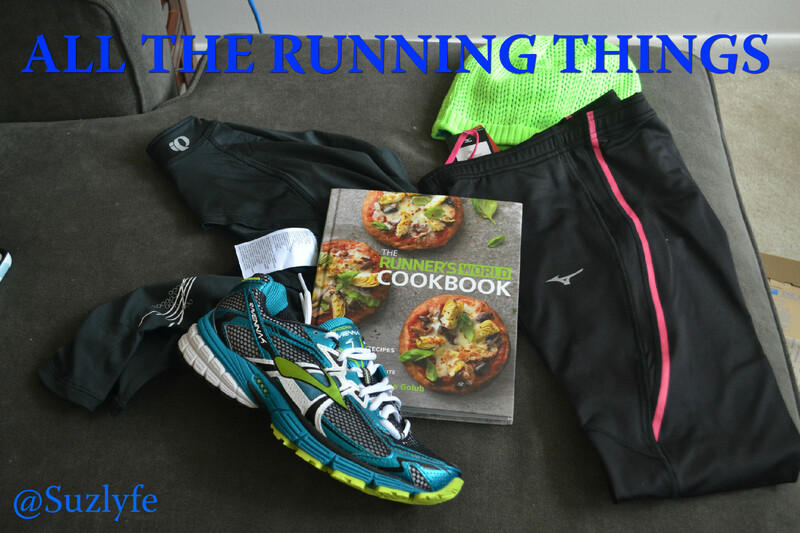 I was very selective about my running gifts–I know how fast the $$ go away with us runners, and though I like to spend $, I tend to restrain myself overall. Except for ProCompression and CWX, but who’s counting? 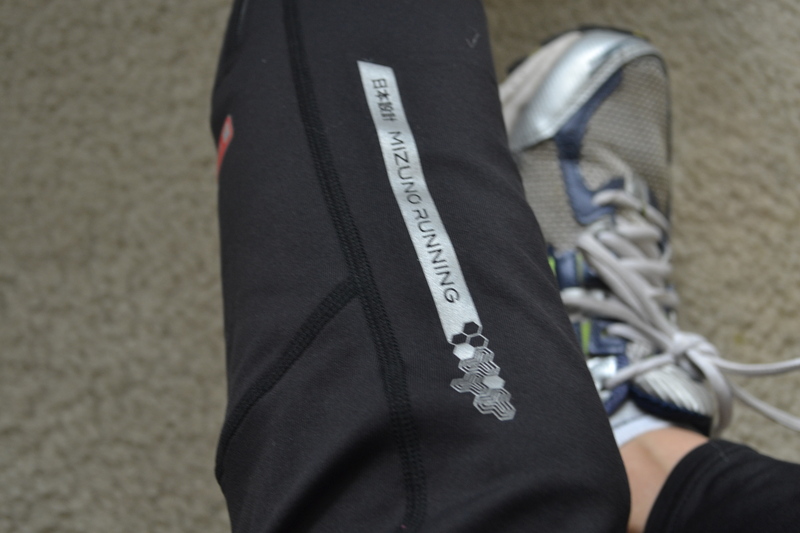 I am so glad that I picked the pieces that I did, and I think that they will each prove to be an excellent investment (unlike the running sleeves I have yet to wear). These were all things that I needed, and I am already getting use out of them! Originally, I asked for a medal holder, spin shoes, and new earphones, but I am glad I went with a few more practical things for the time being. Especially with Alex wanted to drop $$$ on NYE so that we can go to a party with our friends, and given that I just dropped $$$ on wedding photo prints. So I don’t feel guilty. But on my bday, watch out. Practical or Frivolous, what was your fitness haul like? Did you make the purchases yourself, or did you trust others? Any unexpected gifts that made your day? ?